The found footage film "Love goes through your stomach" is dedicated to nutrition and the human relationship to "production animals“. The collage provides disturbing insights into the behavior of a western affluent society between a lack of appreciation and the origin of animal products. The starting material of the film collage is from youtube and serves different internet phenomena such as ASMR, Mukbang and Lets Play Videos. 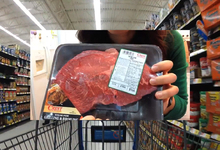 The experimental narrative perspective and precise picture selection are both humorous and bitterly true, pointing out destructive aspects of global consumer behavior.